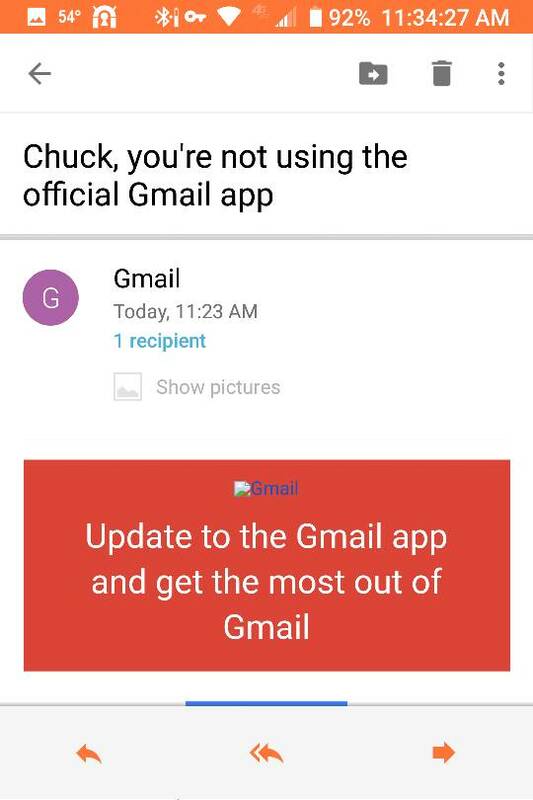 What in the world does "not using Official Gmail App" mean?! Of course I'm using the official Gmail App from Play Store. Is this some sort of attempt to install malware? See screen shot. Yea, I've already deleted it. I seem to be getting more weird spams lately. Annoying! Wow, are Google so desperate they have to resort to spam marketing? I got that too. It seems we get that email when Google sees we're using another client such as the hub to download our @Gmail emails. I'll be happy to forward it to you. Tis the season to spread good cheer. I would get the same email using iPhone, outlook sends the same email. Never got any such email from Outlook. Hi, on the KEY2 model how much memory does the OS and a heavy load of apps use. BB KeyOne - unlocking phone using PIN code (stopped working).